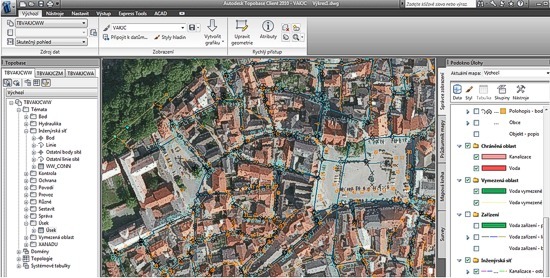 The water distribution and infrastructure group Energie AG Bohemia has choosen a CAD Studio (former: XANADU) solution based on Autodesk Topobase as its new centralized GIS system. Energie AG Bohemia provides water supplies for almost one million people in the southern part of the Czech Republic. This group manages 7.589 km of water network, 3.551 km of waste-water network, and 178 of sewage plants. The increasing demands for the range of the water distribution network, for the effectivity of its maintenance and for the scale of complementary services lead to the necessity of unification of the existing network documentation systems and to implementation of a new centralized network management system. After a thorough testing, Energie AG has choosen Autodesk Topobase and applications by XANADU. The main reasons were the flexibility, scalability and openness of this system, its well-proven implementation in many other companies and organizations. The implementation includes a migration of existing data from five different GIS systems stored in multiple formats (DGN, DWG, Oracle, MS SQL server and DBF). The new GIS solution will be linked with other enterprise systems – customer management, accident management, etc. - which will help to further improve the quality of services provided by the Energie AG group.